Home decor made with heat sensitive gold foiling. I love shiny things. I love shiny paper. I love shiny paper craft projects. I am always looking for new ways to add some glitter and glam to my “works of art”. I have discovered a faux metal foiling product that is amazing and gives a professional look to any DIY paper craft project. It is now possible to make cards, tags, wedding invitations, and business cards (virtually anything that is made out of paper) sparkle and shine with wonderful metallic foil accents. In the past, I have used stamping and embossing powders to add a foil embossed look to paper. Embossing powders will do a “good enough” job, but they don’t come anywhere close to high-quality printing. Paper projects that have been embossed with powders have a bit of a ragged edge and a homemade look. 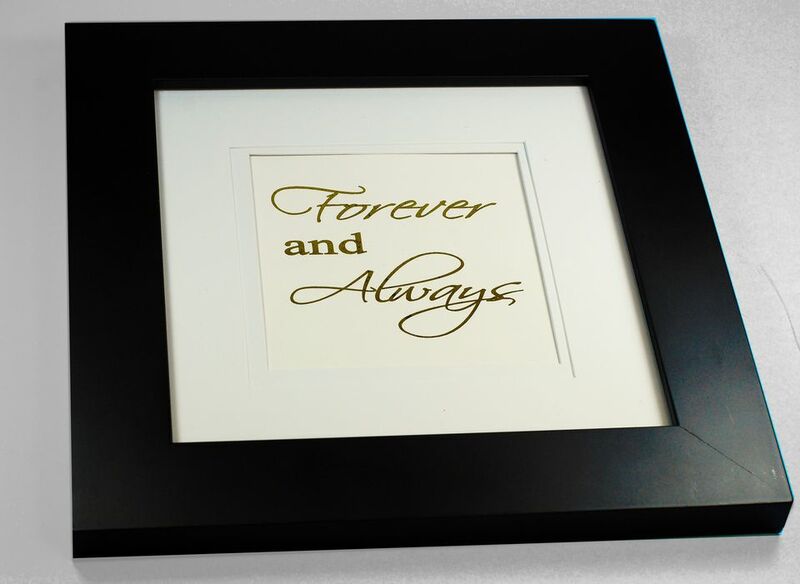 While surfing the net looking for inspiration, I discovered that there is a faux metallic foiling product available, which can be placed over any black and white image printed on a laser printer. It even promised to work on black and white images printed on a copy machine. This foil product promised to work on basically any paper printed with toner. The pictures I saw looked too good to be true. The images were beautiful! It couldn’t possibly be that easy to accomplish at home! So I decided to give this product a try. I found a supplier on the internet and ordered toner reactive gold foil. I waited anxiously for the product to arrive so that I could test it. The foil arrived and I excitedly printed a black and white image on coated card stock. I placed the foil onto the print, covered it with a sheet of paper and ran it through the laminator. I then cautiously pulled off the gold foil not knowing quite what to expect. It was miraculous. The card had beautiful gold, clean, professional looking print. Can I say any more? The product is awesome! The instructions warn that the foil will not adhere to anything printed on an ink jet printer. The magic happens when foil reacts to toner and heat. The combinations of the two produce a wonderful, high-quality metallic accent. I don’t know how long reactive laser foiling has been on the market, but it is new to me and I love it! It comes in a variety of metallic colors so the possibilities are endless. You are only limited by your imagination! The example photos do not show the exceptional brilliance of the cards. The finished projects look much better in person, because it is hard to capture that metallic shine in a photograph. *A quick tip. I have found that coated card stock works best. Print a black and white image onto a sheet of paper. The paper can be any color and texture. The foil will adhere anywhere there is toner on the paper. Place the foil over the image. *A quick tip Make sure the paper is pristine. If there is dog hair, dust etc. it will leave marks in the foiled area. It might be necessary to tape the foil down. Make sure the tape is not on area that covers the image. Place a sheet of paper on top of the foil. Preheat a laminator. It is a good idea to wait about 20 minutes to make sure the laminator is very hot. Run the paper sheets through the laminator. Pull the foil gently off the paper. That is it. That was easy wasn’t it? I have added an example of gold foil printed onto black card stock. I think the results are incredible. The gold foil complements the black paper and the clip art looks so shiny and bright.